Have you ever experienced the thrill of hooking a great catch? If yes, then I know you will want to do it all again in the beautiful Whitsundays. If it’s your first time – then you could not have possibly chosen a better place to start! Whether you dream of landing a Marlin, Sailfish, Tuna, Coral Trout, Red Emperor, GT or Nannygai – The Whitsundays is the place to do it and Renegade Charters are the best choice to get you there. Renegade Charters offer Quality boats, quality gear and quality fishing. Their experienced Crew are the best in the business and they will ensure you have an action packed fishing experience you will never forget! 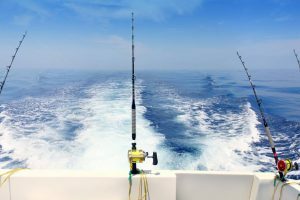 We would love to assist you with booking the fishing trip of a lifetime! Contact us today to reserve your place. See Renegade’s range of charters here.